Solar power plants use energy from the sun and convert it into usable electricity. Because the energy directly obtained from the sun exists in a diffused state, it needs to be converted into a concentrated source of energy before it can be converted to electricity. This is a two-step process that involves collecting solar energy using mirrors to transform it into heat, and then converting this heat energy to electricity. What Are The Types of Systems Used for Concentrating Solar Energy? This system uses curved, rectangular mirrors to concentrate the sun's energy. The mirrors face the sun, and are tilted in a way that the sunlight is directed towards a pipe running down the center of the length of a trough. Oil running through the pipe is heated by this energy. This oil then helps to boil water in a steam generator, to create electricity. A solar dish system is similar to a satellite dish. It runs on sunlight instead of traditional energy resources like gasoline or coal. The dish collects the sun's energy and focuses it onto a smaller area. A receiver absorbs this beam of energy, which is then transferred to fluid in the engine. The fluid expands because of the heat of the reaction, activating a piston to generate mechanical power. This power is used to run a generator to produce electricity. The power tower system consists of an array of mirrors working to concentrate sunlight on to the top of a tower. 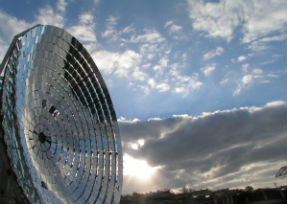 A receiver at the top of the tower contains molten nitrate salt that, when activated by the sun's heat, can generate electricity through a steam generator. Molten nitrate salt holds onto heat so that there is no rush to convert it to electricity during daylight hours while the sun is out. Solar power technologies to concentrate the sun's energy currently provide a low-cost option as far as solar electricity for a large-scale power grid is concerned. The cost of this solar power is currently priced at 9 - 12 cents per kilowatt-hour. Based upon intended advancements for this technology, it is expected that this solar power will be produced for 4 - 5 cents per kilowatt-hour in the coming decades.